In this fun-filled look at fractions, Brian P. Cleary and Brian Gable demonstrate how fractions work by splitting whole objects into parts. The comical cats of the wildly popular Words Are CATegoricalÂ® series divide everything from pieces of pizza to groups of people into halves, thirds, tenths, and more. 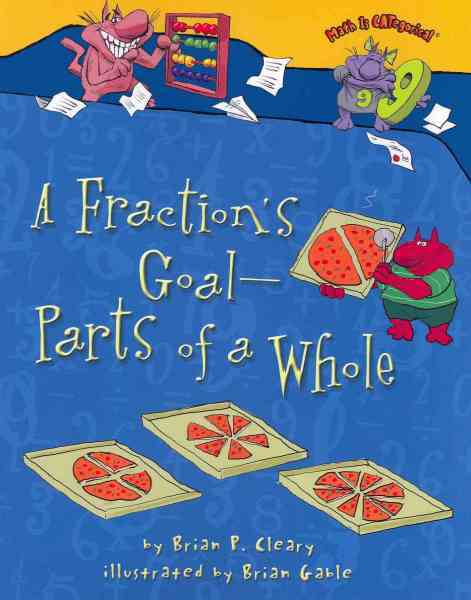 Peppy rhymes, goofy illustrations, and kid-friendly examples take the fear out of fractions. - Ratio and proportion; Juvenile literature. Cleary starts with pizza slices as an example of fractions in action. He also talks about cooking ("Fractions come in handy / if you ever help with baking. / You'll see them in the recipes / for breads and cakes you're making") then touches on terminology (numerator, denominator). Information is limited, but it's an entertaining starting point.